XPR3300 portable two way radio for the gaming industries. 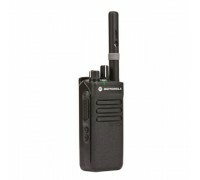 XPR 3000 Portable Two-way Radio offers affordable voice communications for the busy professional who wants better connectivity. The superb, industry-leading audio, this scalable portable lets you transition to digital with a simple software upgrade when your business is ready. Enhanced productivity features include Intelligent Audio and voice announcement for challenging environments. Compact and lightweight, the XPR 3000 is built for day-in, day-out reliable performance. Exceptional Design: The XPR 3000 Series offers a compact and lightweight design, making it comfortable for users to carry during long work shifts. Controls are designed to optimize ease of use, including an innovative new connector design that allows accessories to be securely attached and detached in seconds, without the use of any tools. 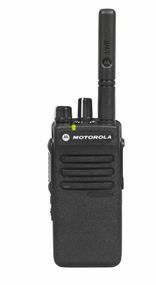 The radio is also rugged and durable, and is rated IP55 for dust and water protection. Industry-leading Audio: When it comes to exceptional audio clarity, the quality of digital can't be denied. XPR 3000 Series portables deliver digital quality throughout your coverage area plus unique features to help your employees hear and speak clearly, wherever they work. With Intelligent Audio, the radio volume automatically adjusts to compensate for background noise so workers don't have to adjust their radio volume to avoid missing a call in loud situations or disturbing others when they move into quiet places. Analog and Digital Interoperability: Operates in both analog and digital modes. Features such as the dynamic mixed mode repeater streamlines automatic switching between analog and digital calls - meaning you only need one repeater to operate both modes. Transmit Interrupt (upgradable at additional cost): Enables a user to interrupt another radio conversation to deliver critical communication exactly when and where it's needed. Basic or Enhanced Privacy (Enhanced Privacy upgradable at additional cost): Built-in scrambling for increased security. Opt for this single site, digital entry-level trunking system that maximizes the capacity of MOTOTRBO by connecting several repeaters together. You can use it for a high volume of voice and data communication and link over a thousand users at a single site without adding new frequencies. The Digital Voting option offers an enhanced level of coverage for wide areas and difficult geographies. Use your IP network to extend the voice and data capabilities of MOTOTRBO by linking repeaters together. You can create a continuous network that covers employees at 15 geographically-dispersed locations. You can also link up to 15 sites to create wide area coverage or enhance coverage at a single site that has physical barriers. Expand the capacity and extend the coverage of MOTOTRBO with this multi-site, digital, entry-level trunking system. It leverages the high capacity of Capacity Plus with the wide area coverage capabilities of IP Site Connect to keep employees at many locations affordably connected.